Alright folks. You asked and Barry answered. Every. Single. Question. Thanks for participating this week in “Ask MercyMe”. Hopefully now you will know everything you could ever want to know about the man behind the guitar. Click “More” to see Barry’s answers. Monday we will ask Robby so get those questions ready. Hi Barry. Can I touch your head? It’s like when I see a silk blouse hanging in Dillards department store. Even if the thing costs like $200 I want to touch it. It looks so soft and smooth. But, seriously, what’s your favorite childhood memory? My favorite childhood memory is…well I have 2. The first one being, camping with my family which we did A LOT. 2) In the summer my cousin Jay would come to my house quite a bit. Me, my brother Tom & Jay would then head to the woods just to hang out, play, cook beans over an open fire and play army. Two different memories but similar in that they both involved food, fire, and being in the woods. I had a great childhood. Hi from a fellow runner and SRV fan. I love your music and guitar sounds. Do you have any suggestions for a guitar rig (pedals, amps) for someone on a limited budget but wants to be able to get some good guitar sounds for church and home? Thanks! There are so many different ways to go about putting a rig together that it boggles my mind. It sure is fun though. For church and home I suggest staying small and compact. Fender makes some great small amps that get a nice warm tube sound. One of my favorite amps is the Fender Pro Junior. Cost is about $220. I have used it on just about every record. Just a volume and tone but a sweet warm sound. As far as pedals on a limited budget, I would recommend the line 6 mod (blue one) for some effects. There are so many dist pedals I don’t know where to begin. At the very least spend money on one that has 2 options. For delay I highly endorse the TC Nova Delay. With 9 presets in a delay pedal you can’t go wrong. Hope this helps. Aside from playing with the greatest Christian band, what was your other most accomplished thing in music? Why is it the best song on every MM CD is the last song (I would die for you, Finally Home, In you, Keep singing, etc)? When I get your CD’s the very first song I go to is the last song and becomes my favorite song! I love singing your music too at church too. May God continue to bless you and the rest of the band. Also love the new website. -I consider just being blessed to play music for the amount of time that I have been able to is an accomplishment. -Favorite verse is Ephesians 5:15-16 Be very careful then how you live-not as unwise but as wise, making the most of every opportunity because the days are evil. It’s just a good daily remider for me. -That’s funny about the last songs. I really don’t know why. Sometimes the ones that are more organic or emotional end up last on the list for whatever reason. Sometimes it really is the only place to put them in regard to the rest of the order. Since I complimented Mike on the guitar stuff on all the albums, I throw one your way. Props. Anyway, what’s your favorite guitar that you own? P.S. Loved meeting you guys back in January at WinterJam and taping part of the show for ya! -That would have to be my 77 Les Paul with Seymour Duncan mini humbuckers! Shaved Bald, or Naturally Bald? Would you be interested in growing a mustache for a little holiday called mustache may? -Colorado today (since I’m answering this question from Co Springs and just got back from visiting Pikes Peak. At 14,110 feet ( we only made to 13,000, top closed due to high winds) it was gorgeous!!! -Since these are my only 2 options. Cardinals. But being from Baltimore the O’s are my 1st love, and then the Rangers. Shaved bald since 99 but now probably part naturally bald. What’s the story behind the “Have Fun” song at the end of “Coming Up To Breathe”? Also, I would like to be the first to ask you what kind of hair products you use, citru shine maybe? I just had to try my hand at being a comedian. Hope you found it amusing. I agree with Todd about the last songs and MM being the greatest. God bless! -Have Fun In Life is the hidden track at the end of the Coming Up To Breathe record…oops, cats outa the bag now. Our booking agents brother is a singer songwriter (Todd Snider) and does a similar style song that we just loved. Bart and I were rooming together at the studio during the recording of CUTB. It may have been the 1st morning we were there, either Bart or I or both of us (I can’t recall) were singing the Todd Snider song and said, “ man it would be cool to do a song like that” Well, Bart got into the shower and upon exiting had the lyrics and melody to said masterpeice. I grabbed my little handheld recorder for times just like these and he sang it oh so beautifully. We took it dowstairs to the studio and I’m pretty sure it was the 1st song recorded for that record. Huh…interestingly enough it’s the last song in the sequence, technically. That’s it, it was a while ago but pretty acurate. I’ve heard that prior to MercyMe that you played with DC Talk, what other bands have you played with? How long have you played guitar and how did you get into the music business? Who influenced you the most, musically? – I lived in Nashville for 15 years freelancing for whoever I could work for. This is some of the list from what I can remember. Ric Cua, Halo, Mogan Cryar, Renee Garcia, Whitecross, Fugitive Popes, Michael Sweet, Whitheart, Sonic Flood, Hullabaloo, Michael English, Phil Joel, PFR, The Waiting, Audio Adreneline, Tait, Toby Mac, and the aforementioned dcTalk. -I’ve played guitar for about 30 and some odd years. I played in high school and post high school cover bands wanting to be a rock star not even knowing that Christian music existed, and in 1979 it wasn’t as prevalent as it is today. Then a friend and fellow musician played me a song by the Altar Boys and it blew me away. I had no idea. Well I gave up the “devil music” so to speak and started playing with a Christian band at any function we could. I really saw this as a great ministry and wanted to do it full time. Well I took some youth to a camp one summer and Chris Rice happened to be providing the music that week. I talked with him a bit and shared with him my musical aspirations and to make a long story shorter, some time after that I went to Nashville and stayed with him for a week just to check it out. He was very gracious to probably an overly eager music career seeker. (yes I made that rhyme up) And the rest is history. Since that 1st time hearing Christian music I have wanted nothing more than to see lives changed through music and I am very blessed that God has given me that opportunity. 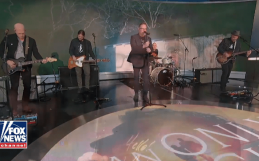 -Tom Petty, U2, Alison Krauss, Led Zeppelin, Stevie Ray Vaughan, Jars Of Clay, Jack Johnson. And the list goes on & on & on. – For about 5 years in a cover band we learned at least 1 but a lot of times 2 new songs a week just to stay current, so in my formative years I was influenced a lot by all of the different styles of songs I had to play (love that disco). That’s probably the reason why I like and like to play so many different types of music. Guitar wise I would say that Jimmy Page and Eddie Van Halen played a big part in my style of playing. Favorite MM song of all time? -Hamburgers, hotdogs during baseball season! -Jesus, my wife, family members, I guess given the right circumstance just about anybody. Barry…in a knife fight in a dark alley, on the seedy streets of Gotham, who would win…you or The Joker? -Why I would of course! He would try to come at me fast but I would slay him in a speedy battle of wits before he could get close enough to me. Ha! I would also have a light saber up my sleeve just in case I hadn’t had enough coffee that day. Next!!!! Have you always been bald? What’s the funniest thing you’ve ever seen/heard/done/etc? Do you ever get sick of answering the same questions over and over and OVER? -Descent Into Darkness (A Navy Divers Memoir) It’s about a dive team that salvaged the ships after the attack on Pearl Harbor. I love WW II stuff. -Being covered head to toe in mud after slipping down a hill into a stream at Mammoth Cave in Kentucky. -Fucia? No…black…no wait green. Yeah that’s it, green, then black. -No, I lie and make up new answers to the same ol’ questions and leave it up to the reader to decide? ? Who takes the longest to do their hair? Who gets haircuts most often? -Not really sure but I would have to say Robby on all counts. The mohawk requires gobbs & gobbs of time. What’s the biggest difference between the onstage performing experience with dcTalk and MercyMe? -Playing for dcTalk was similar to being in MM in that, even though I technically wasn’t a part of dcTalk (just a sideman) I kind of felt like a band member at times. It was a nice family. -I can’t really say there’s a huge difference in performance. In both settings I gave and continue to give 100% of what I am asked to do. In regards to MM I will say it’s pretty awesome when the audience is worshipping right along with us. 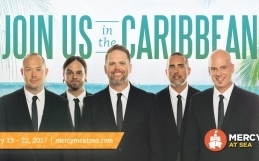 what was it like for you to join mercyme as a full time member? and before that….you toured a bit with them, right? like just a job. Being in MM allows me to be a part of every aspect of the ministry and the creative side as well. -I first met MM during festival Con Dios when I was playing for Toby Mac. I then spent time with them on another tour called the Go Show while I was playing for Audio Adreneline. It was at the end of that tour I joined MM. Hey Barry, first of all, i like you hair style —I looks very easy to maintain..
1. how often do you have to shave it?? -Robby may get a punk rock comment now and then due to the mohawk. I was wondering, what’s the longest your hair has ever been? Close to the middle of my back. A long long time ago! What can you see from the stage, anything? -Wow tough question. I love the east because of my roots being there, but, after so much travel I have fallen in love with the west as well. Mostly the northwest. If you’re gonna make me choose, I’m gonna have to go with east. Closer to my family, Camden Yards, Maryland steamed crabs, NYC and the Outer Banks. – Health for us and our families while we travel. And that we would stay focused and faithful with the task that God has given us. – Everything, I’m not kidding, so no napping. ? Unless of course you had a really hard day and then we’re happy to provide some lullabies. I have playlist of favorite songs on my computer and last night I clicked one that had a lot of the songs from “Undone” and as my cursor went by the songs I noticed that you had written most of the songs on that album. How many of MM songs have you written? Undone is my favorite album. -I love Undone as well. My name appears on a lot of Mercyme songs (Undone to All That Is Within Me) because we write as a band for the most part. There are a handful of songs that were penned solely by Bart (he does write 99% of the lyrics) and then there are some written by maybe just a few of us. It’s different every record and ya never know how it’s gonna work out. Barry, my favorite MM song is “Keep Singing”. Do you have any bible verses that provided you inspiration and comfort in co-writing that song? Thank you so much for that song, it speaks what’s on my heart as follower of Jesus. -So glad you like it and that it ministers to you. Sometimes an idea for a song hits you in a moment and you have to roll with it. Keep Singing is one of those songs. Bart got the idea from his father in law I believe, when, after all the tragedies that took place during the making of Undone he asked Bart “how do you do it” Bart replied, “I just gotta keep singing” to be faithful to the calling and also to probably help deal with the pain. As I recall, it wasn’t a laborious task sitting around throwing out ideas. Bart, Pete Kipley (our producer at the time), and I were finishing up at the studio late one night and Bart said “what about this” I think the song was finished in a matter of minutes. Although we didn’t have the Bible out I believe God showed up and Breathed into Bart a great melody and Lyric. Did you ever find out what happened to the cows that disappeared from the yard behind your house??? You may need to call Maulder and Sculley…..
Let me know what you think….these are GOLD baby. No seriously Jimmy Page, Eddie Van Halen, Ken Polvino or Steve Lukather, who’s your favorite?? -Since I’m fond of live albums, I’m gonna go with Barryed Alive. -Jimmy Page hands down. I don’t have the time nor the typing skills to explain why. Timeless playing I guess. I asked mike this same question but it differs from person to person so here goes? What is your favorite guitar, effect, and amp? What other instruments do you play besides guitar? -Man I really don’t have a favorite guitar. In a pinch I will go to my 77 Les Paul. There are weeks when I will get on a blues kick and play nothing but a Strat. Being in the industry for so long I’ve aquired quite a few guitars. They each sound and feel different but I wish sometimes that I could get any one of the tones out of just 1 guitar just for the ease of changing sounds and saving space. Ha. Then I come to my senses since I’m a bit of a purest and am glad that each one does what it does and no more. I started playing the trombone in the 4th grade and played all the way through school. I don’t own one anymore but if I did I’m sure I could play it, with some practice. I bought a really nice Dobro (Beard) about a year and a half ago and am trying to wrestle that thing to the ground. A little bit of mandolin and I think that’s about it. -My new favorite amp is the Gabriel Voxer 33. Awesome tone! 2 channels, 1 Vox 1 Marshall…both killer! -I love Keeley compressors and my new TC Electronics Nova delay. 9 presets of delay…in a pedal…with a tap… transparent delay. Check one out. What is your favorite memory since being involved in CCM? I have seen from the scrapbook blog you guys have met alot of cool people..Who has been your favroite? – Your timing is impeccable. We are providing worship at a Generous Giving conference in Colorado Springs this weekend and I just heard Louie Giglio speak. I am an avid astronomer and he really hit home tonight talking about and showing amazing images of the heavens and objects in it, and about the vastness of the universe and beyond. Of course, at the end and the beginning of all that is God. I spend a lot of nights looking up into space at the incredible work God has done and sometimes forget how big he is and how small I am but nevertheless created by Him to love and worship Him. It was a great reminder. -I guess it would have to be Bono. Shaking hands with him and snapping a few pics which I believe took all of 4.5 seconds until they whisked him away, was the most absolute shortest and greatest time I’ve ever spent with any celebrity ever! It’s still a blur. I have to check back at the pics every now and then to remind myself. Awesome! -It was a long long time ago living at home with my parents when I was about 10 or 12. My dad and brother were having a”prank day” that I wasn’t in on. Well I knew dad would be coming to the kitchen at some point and luckily for me his timing was perfect. I took a rubber band and wrapped it around the spray hose thingy so that it was alwasys on whenever anyone turned on the water. I aimed it toward the front and you guessed it, dad came to the sink to get some water and WAMMO!!! Cold water drenched him right in the middle of the shirt!! The beautiful thing was that he thought my brother did it. I think that ended prank day. -I grew up Baptist and on Sunday nights sometimes we would have favorite hymn night. I rarely called out hymns but I couldn’t wait for “Since Jesus Came Into My Heart” I always loved the more up tempo hymns. Probably the reason I love quick 3 minute pop songs. I’m sure there’s a parallel in there somewhere. Oh, and any hymn from Barts new Hymns record. You’re gonna love it. Thanks for all the questions folks. See you soon. Thanks Barry! We really appreciate you taking the time to answer our questions. These question and answer times are great. We get a little window to the rest of MM that we wouldn’t ever have a chance to know if it weren’t for these questions. Thumbs up to who ever had this idea! Thanx Barry and to the rest of the band. You exemplify Christ and the genuine love you have for your fans. These are not small snippett answers but well thought out answers and I thank you for the genuine humility that comes across in each answer. May God keep you great, humble and fun. That is why I love this website and that is why MERCYME is my favorite band. May God bless you and may God’s love always shine upon you. Love you guys and see you in Denver soon. Hey MM this Jamie Van Zee one of the twins. I was wondering if you got the message,you can type us at kvanzee@siouxvalley.net.Maybe you can give us your e-maail address.i found an idea for a song. I guess I’m getting on the “Ask Barry” bandwagon a little late… sorry! I’ve just recently discovered MM. A friend let me borrow Coming Up To Breath, and after listening to it for a week, I went and bought my own copy. I listen regularly. I stumbled across McPherson guitars about 3 years ago. I really believe they are the very best acoustic guitars made now, at any price (and considering the price of some Collings, Goodalls, and Olsons, McPhersons aren’t really all that expensive..). Anywya, I’ve got a question about your McPherson. I just saw the “So Long Self” video, and it looks like yours is maple… right? Also – yours is the only one I’ve seen that has fingerboard inlays. Just curious – what did youhave to do to get Matt to build one that way – or did you have the inlay work done after the guitar was in your possession? I don’t yet own a McPherson (I’m an engineer full-time and just play music because I like it… praise band at church, special events, you know…). However when I do purchase one, it will most likely be rosewood with a cedar top (I’ve always loved the sound Phil Keaggy has with his Olson). I do have a 1975 Mossman Great Plains, which I’ve owned since 1978. It’s a great sounding guitar, but as much as I love it, from a playing standpoint, it really can’t keep up with McPhersons. Ok, I’ve rambled enough. I’ll continue listeneing, and I’ll see you at Worlds of Fun in Kansas City this summer (I live in Wichita, KS). I have run across a song that Todd Agnew was singing called “Beautiful”. Unbelievable song. I looked up the lyrics and it says you all wrote it. I looked all over the place trying to find it on a cd or what I’d really like to find is sheet music. We started a praise band a couple of years ago in our church and I would love to sing this song. Is it published anywhere that I can buy it? Thank you for sharing your talents. You are truely a blessing. I know this is not a question but an 11th hour “Happy Birthday” wish from Susan and myself back in Baltimore. To Les Lyne, Glad you’re enjoying Coming Up To Breath. Yeah Mcphersons are pretty great! That is an all maple one in the video. The dot inlays are none other than good ole “white out” I had to do it because the stage is so dark at times. I have another Mcpherson thats Indian rosewood/redwood and while it was in for a tuneup they went and put inlays in for me. The maple still has the white out. It’s a little embarrassing but ya gotta do what ya gotta do! Are those woods on your McPherson your ideal combination, or were you just looking for looks. I think the flamed walnut looks absolutley stunning, as well as the all Koa guitar. I just can’t imagine it getting the kind of resonance you would find in like Red Spruce. I rarely pick an ax based on looks. Tone and playability only with an occasional favorite color. I picked my indian rosewood with a redwood top because of how warm it sounds. I would no doubt be disappointed later if I was concerned with looks. what would it take to have ya’ll play at the most rewarding event i know?Its free camp and its for kids who cant aford church camp like most familys.We are having our first national camp next year and its all ran from a tiny church in texas.so i was just curious what it takes to get a band like ya’ll involed? I know that you guys go totally clean with your McPherson’s, but do you have them going through your TU-2 or anything for silent tuning? You would pretty much have to have two TU-2’s. Another great guitar is a Gibson Songwriter Deluxe. I played one the other day and man, I was totally captured in its action and tone. My wife has been pushing me to go down to nashville and pursue studio musicianship, or to go through a hiring company or something along those lines. Ideally, a band would be awesome. I think we are going to seriously consider packing up and going. I have a friend who might have some contacts, but would you happen to know where I could maybe get a start? I am an amature photographer with Parkinsons Disease. I took pictures in my neighborhood last spring and when assembled with I Can Only Imagine the video is quite moving. I ask your permission to distribute copies with your music. I can place it on YouTube if you agree. I just want to know why the band does the cover tunes? I love your songs on yor cd’s but I have a problem with the secular music? I’m italian and this is the reason of my bad english. I’ve discovered MM casually, but I’ve loved them very soon. My secular music preferences goes to Beatles and James Taylor, so I love very much the way Mike and you armonise guitars in ev’ry song (like they do). The question is: how do you decide ev’ry different part of the song to play? Someone says “Ehi, Barry, do this”..or maybe “you can do this way…” or is you that bring you ideas? And who decide (betweeen you and Mike) who play what? Hello from your friends at MRBC! My daughter & I watched MM’s Christmas special on Gospel Music Channel last night. We really enjoyed the music but would much rather see you “live & in person”. When is MM coming back to the Baltimore/DC area? I hope you & Karla have a Merry Christmas and can get home to see your folks. Hey Guys i would love for you guys to come play in Little Rock Arkansas, I am truly blessed by your music , please put Little Rock on your Tour , Please. I saw you guys back in 1998 or so at a christian college conference in new mexico. You were the worship team and I bought your two first albums made. I can’t recall the name of them but one was purple/black cover color and second green/black. I think…. Anyways, I misplaced them and have been trying to buy them (for 5 years) because they had some of my favorite worship songs and I would love to get my hands on them again. They are not for sale anywhere. Is there a way I could get them again? I am sorry I don’t remember the name of the two albums. So long ago BUT I some of the best music made. PLEASE HELP. Can you email me? Take care. Keep up the good work. thanks. I’ve so thankful for your songs. Is it ok to use one of them as the ringtone on my cell phone? By the way, Spoken For is my favorite cd! Praying for God’s continuing blessings for you all.